john4jack (Corvallis, Oregon, United States) on 24 September 2009 in Sport & Recreation and Portfolio. YESTERDAY - What most people liked best about yesterday's shot was the silhouettes. Some wished that I had cropped the photograph to just the silhouettes. The reason for not doing that is that this is kind of a story telling series and that was my opening shot, and I felt that I needed more than silhouettes for my beginning. For fun, I went back into LR and did a crop; it looks pretty cool. Love the brilliant color and clarity of details with the flame at the heart of the matter! wow.. this photo is bursting with vibrant colours... Great shot. The colors in this picture are so vivid and to beautiful! Great colors. I|Not quite able to tell the story like yesterday's post. Glad yesterday's shot went down so well with everyone else and not just me! Just the silhouettes would certainly be an abstract shot ..I'd like to see it one day! This shot really brings out the heat in it all..I suppose the orange and reds help! Good one! This is a HOT shot ... wonderful captured! I agree...it looks very cool!!! Very nice composition with just a peek at the blue sky behind! Excellent! I like the action of the flame and everything that means to a balloon. Wonderful color and composition. Magical colors ... brilliant shot! Impressive colors. Love the flame and how it looks so intense. How fortunate to be up close. Great shot, Jack. @Barbara: Thanks, Barb. It was neat to be able to walk amongst the balloons. Love the colors, the heat and a bit of blue sky to ground it all. Love the composition and of course the color. Wonderful. wonderful rich color!! such dynamic lines and composition! Fire it up! That is a great shot, Jack. Love the colors and the drama. i can imagine the silhouettes being cool. I like the color and clarity here. Beautiful colors. I like the silhouettes on yesterday's post as well, but I also like that you left the rest of the story in the image. This looks like a great way to spend the day. @willow: We actually were there for only about 1.5 hrs. des couleurs magnifiques sur cette langue de feu !!! I can feel the heat (fire) and the warmth (colors), both are so positive, i thank you twice ! Another great balloon shot. Did you fly? I have gotten to go up 3 times and it's awesome. @B. Thomas: Not this time. Went up in Sedona 20 yrs. ago. A very bright , crisp and colorful capture. Very nice John, love the yellows and detail inside the balloon. 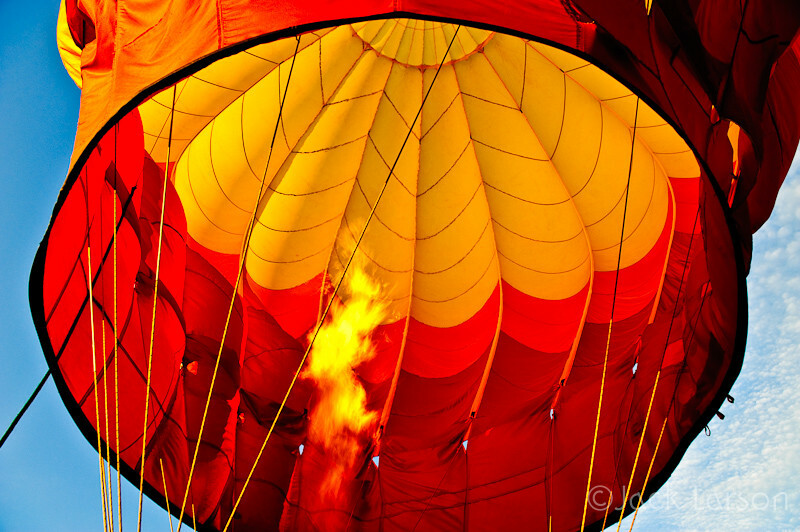 @LCImagery: The best access to balloons that I have ever had. Simple mechanics of the fire that can make you fly. The pattern of the inside of the balloon is really looking beautiful. Hot, Hot, Hot Jack. The colour in this shot is superb. You did an excellent job of capturing the flame also. Fantastic image. I love the colours. I'm glad you posted yesterday's. Super catch, wow it is quite exciting, you must have been thrilled to see how well it came out, bravo again! Staggering use of the camera.